Even though we’re not yet there, are you thinking about deer season? Although it’s still a couple months off, now is the perfect time to start thinking about getting a new scope for your shotgun for deer hunting. We’ve done the research and have put together a list of shotgun scopes for deer hunting. Read this review, and you’ll be able to find the best one for you. Like any product, you’re going to get what you pay for with a shotgun scope for deer hunting. While you don’t necessarily need to spend an arm and a leg, it’s worthwhile to carefully consider your goals in getting a scope to figure out which one is going to be the best one for you. Remember to take into consideration your abilities as a shooter before selecting a scope. For those who are newer, a scope like the Simmons 517793 Prodiamond Shotgun Prohunter Riflescope may be a great choice for you as it’s not too expensive and can give you experience shooting with a scope on your shotgun. For those who are more experienced, the Bushnell 751432 Trophy Riflescope, 1.75-4x32mm or the Nikon ProStaff Shotgun Hunter 2-7 x 32 Black Matte Riflescope may be great for you as they have some fancier features that may be more well-suited to a more experienced hunter. In either case, remember that, unlike a rifle scope, which may need to be more complicated, a shotgun scope for deer hunting has two main goals: 1) allowing you to pinpoint your target easier with crosshairs and 2) giving you greater magnification. Thus, when selecting a shotgun scope for deer hunting, the following characteristics will likely be most helpful: clarity, design, durability, eye relief, and simplicity. Make sure that you select a shotgun scope that has good clarity, meaning that it has good resolution and a sharp view. It doesn’t necessarily have to be the most expensive scope out there, but also don’t compromise clarity for a cheaper cost. Since you’re shooting a shotgun, not a rifle, you don’t need the maximum magnification. A shotgun scope with slight magnification will do the trick. You won’t be shooting as far as with a rifle, so you don’t need as much magnification. At the same time, take into consideration the range that you hope to use the scope for. If your target is outside the range of your scope, you will lose clarity on the target’s position and will have to move closer to or farther away from the target. You should take into consideration your shotgun when selecting a shotgun scope. You don’t want a scope that is too short or too long. A scope that is the wrong size may not even mount on your shotgun in the first place. Also, think about the weight of the scope. If you’re a smaller female, a heavier scope like the Nikon might be harder to manage but might be fine for male hunters. Remember that you are hunting, so you don’t need a glossy black scope. Matte or camo-colored scopes are going to be much more useful in trying to blend in. Be sure to select a shotgun scope that is durable and isn’t going to break as you go thrashing through the woods or if you accidentally hit the tree when you’re in the tree stand. Since a shotgun scope is likely going to take more of a beating than a rifle scope, you should especially focus on durability in three areas: 1) the lenses, 2) moving parts on the scope itself, and 3) the body of the scope. All three areas need to be at least water resistant and ideally waterproof. Pay careful attention to the lenses. You don’t want them to chip, crack, or fog up when you’re trying to shoot. Eye relief is the distance between the scope and your eye. If you have too little eye relief, the scope will hit you in the face, causing “scope eye,” which occurs when the recoil of a gun slammed the scope into the hunter’s face. If you have too much eye relief, you won’t be able to use the scope because you can’t see through it. Consider the type of shotgun you will be using with your scope. If it’s a 10-gauge shotgun, you’re going to need more eye relief. By contrast, you’ll need less eye relief for a 20-gauge shotgun. You don’t need tons of fancy features unless you’re trying to live off hunting like Pa Ingalls did for his family in the Little House series. Especially for a shotgun scope, you don’t need it to be complicated. A scope that has good clarity and durability will be all that you need. Also remember that you don’t need a scope with ultra-bright technology because you’re going to be outside when there’s at least a little light. The simpler, the better. Below you’re going to find our breakdown of each individual scope. All 5 of these scopes would be great shotgun scopes for deer hunting. As we stated earlier when looking for shotgun scopes for deer hunting, everyone has a slightly different budget. With that in mind we’ve put together a list ranging in price so you should be able to find a suitable shotgun scope for deer hunting. We like to make sure that you know what real customers of products have to say about them, so we’ve compiled their thoughts into this list of shotgun scopes for deer hunting. There’s a lot of great things to say about the Bushnell Trophy Riflescope, 1.75-4x32mm. It’s a basic scope for a reasonable price. Many people mentioned how they liked the circle reticle and the clarity of the scope. One person in particular noted how he liked the bold outer crosshairs, which allowed him to focus on moving animals, while he could still use the fine inner crosshairs for sighting in. Although the focus of this article is deer hunting, some people noted how the circle reticle was also great for turkey hunting. The reticle is bright and clear and has great quality levels. Some also mentioned how they thought the eye relief was excellent while others thought it was simply good. Additionally, the flip covers are quiet, which is ideal for hunting. Although this scope is shown in matte black, it also comes in a camouflage color, which could be helpful in hunting. Some people really liked the MOA turrets because they were audible and tactical, meaning that you and hear and feel them click. Finally, the Bushnell scope is waterproof/fogproof/shockproof with fully multi-coated optics. Many people deemed this scope an ideal choice for sub 200-yard ranges and considered that it worked perfectly at a 100-yard range, which is going to be the range for most hunters with shotguns anyway. The ProStaff line of scopes may be Nikon’s entry-level line of scopes, but people couldn’t stop raving about how amazing this Nikon ProStaff Shotgun Hunter 2-7 x 32 scope was. Many noted that while other brand names may have more credentials in the shooting arena, those scopes couldn’t compare with the quality of this Nikon scope. It has clear optics and is great in low light conditions. Many observed that the clarity was unreal and that the scope was very durable. In addition, unlike other shotgun scopes, this scope is great at longer ranges. One person mentioned how he easily hit bull’s eye at 25 and 50 yards and was just outside the bull’s eye 1MOA at 150 yards. Finally, the scope holds zero well. What most people raved about was the BDC (Bullet Drop Compensator) reticle, which allows you to sight in the scope and then use the circles below the crosshairs to shoot at different yardages. This scope has four drop circles, which means that if you sight in the scope at 50 yards, you can use the circles below the crosshairs to shoot at 100, 150, 200, and even 250 yards without adjusting for elevation. Nikon also has an app (Spot On) that can tell you exactly which markings to use on any bullet from any manufacturer on scopes with BDC reticles. It can also tell you the target distance and zero. Some people noted that the app can be confusing at first, but after a use or two, it works very well. Pro tip: You can also use the Nikon Spot On app to make sure that your rounds will work with the scope. There were very few negative comments. A couple people said that eye relief could be better while only one person said that it was tough to focus at full magnification, causing optical occlusion (the dark ring around the outside of the crosshairs). On the whole, though, this scope was one of the most widely recommended scopes. Many considered it to be ideal for hunters of any level. If you’re just getting into hunting and you’re a younger and/or smaller hunter, this Simmons Prodiamond Shotgun Prohunter 4×32 scope could be a great option for you. It’s very lightweight (8.6 ounces), which is half the size of some shotgun scopes! It also has great eye relief, which would be helpful if you haven’t handled a shotgun often before. A lot of people use this scope for turkeys, as it’s great at closer ranges (50-70 yards). It has decent light transmission, the clarity is good, and it has a great reticle. Several people mentioned how much they liked the diamond reticle. Some also noted that the scope handled recoil well, while others had more difficulties with recoil, noting that the scope did not survive 30 rounds of 3030 while also mentioning that Simmons quickly sent a replacement, and that individual did not have any difficulties with the replacement. Some people observed that the image quality could be better, but on the whole, many considered this scope rugged, dependable, and durable. Some even stated that they had never had issues with this scope in almost 15 years of using it, including successfully killing several deer and turkey with this scope. What most people raved about the Konus Shotgun Black 1.5x-5x32mm scope was the glass etched reticle. Often used on military and tactical scopes, the glass etched reticle is known for its ruggedness and its ability to withstand extreme forces. Etched on with precision on multi-coated optical glass, the reticle will not break or misalign. Almost everyone mentioned that the glass was very clear and the reticle made it much easier to be accurate on longer shots. 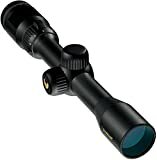 Most people agreed that this was a good optic for the price and that it worked great at most hunting ranges of 20-150 yards although some even had success out to 250 yards for deer. Many liked the bright optics with the clear image and the durability of the scope, calling it fast, accurate, and versatile. Several people also noted that they maintained zero ever after multiple shots while mounted on a variety of shotguns, including a 12-gauge slug shotgun. Some also observed the durability of the scopes, stating that they were solidly built and the best scopes for the money. One person did have difficulties in getting the scope to respond to aiming adjustments, but others noted how the adjustments were precise. Additionally, that person noted that the clarity was just average, but that the scope worked well for most hunting ranges (sub 100 yards). In the end, almost all agreed that the Konus shotgun scope is an awesome scope for the money because it is bright and clear with great depth and light transmission. 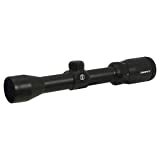 Very reasonably priced, the TRUGLO 4x32mm Shotgun scope is considered by many to be an excellent scope for the price. The diamond reticle is specifically designed for shotgun hunting and is ideal for hunting deer (and turkey). Most people loved the diamond reticle although a few people didn’t like the diamond crosshairs, but that seems to be more of a personal preference. Many individuals commented on the clear image and crisp crosshairs as well as good eye relief. They also observed that the scope worked well in low light conditions and liked that it was also available in Realtree camouflage. The scope is also very durable and scratch-resistant, and many people considered the scope to be excellent for small game, as it is excellent at closer ranges (50 yards and definitely sub 100 yards). Additionally, some noted how the smaller size of the scope made it ideal for a smaller firearm. Many also liked the eye relief. Finally, many noted how it maintained zero. Some people had issues with rings unscrewing, which caused fogging and condensation in the scope. But others noted that they just had to adjust the rings and tighten them up and had no issues after that. Some also noted that this scope was not good for high recoil firearms. Additionally, some noted that the scope did not have adjustable magnification or illumination, but that that was clearly stated on the product description, so the buyer knew what he or she was getting when purchasing the scope. Finally, some people mentioned that they had difficulties in getting the scope to focus. For those who had more negative comments, they often thought that given the price of the scope, it was a decent value, but that it might be worthwhile to spend a little more on a scope for the more experienced hunter. Most people considered the TRUGLO scope to be a very good product for the price and that it was ideal for a first-time optics user. Can you use a shotgun scope for another purpose besides deer hunting? Yes, you can also use shotgun scopes for hunting any game, including birds (such as turkeys) where you normally have a much smaller range. Using a shotgun scope allows a hunter to more accurately hit turkeys where the vital area is much smaller than larger game. Are there major differences between rifle scopes and shotgun scopes? Yes, a shotgun scope has a different reticle from a rifle scope because the former (shotgun) shoots slugs while the latter (rifle) shoots smaller bullets. The shotgun scope accounts for the fact that the slug is going to drop faster than a bullet. The magnification factor is also different. Because a shotgun doesn’t have the same firing range as a rifle, the magnification on a shotgun scope is likely going to max out at 4x while a rifle scope may magnify up to 30x. How do the reasons to use a shotgun scope differ from the reasons for using a rifle scope? Both rifle and shotgun scopes help you see the target better. The difference is that most people are going to use a shotgun scope for shorter distances than a rifle scope as a shotgun slug can’t go as far as a rifle bullet. Most people aren’t going to be too effective with a shotgun past 100 yards, of course depending on the ammo and shooter, scope or not. But that’s not a problem because most hunting ranges for shotguns will be 20-150 yards. You will likely use a scope on a rifle for longer distances. What’s the average cost of a shotgun scope? The average cost of shotgun scope is around $100-$150, although if you’re on a tighter budget, the Simmons and the TRUGLO would be an ideal choice as they are cheaper. Hopefully we were able to help you find shotgun scopes for deer hunting. Our top 5 picks covered a range of price points and features that should be suitable for most budgets and still have the clarity, design, durability, eye relief, and simplicity that you need. You still have some time until deer season, but, with any luck, this article helped get you enthusiastic about it! If you enjoyed this article, please share it with a friend and leave us a comment below. Thanks for reading and if you enjoyed this article you’ll also like reading about the best green light for hunting at night.